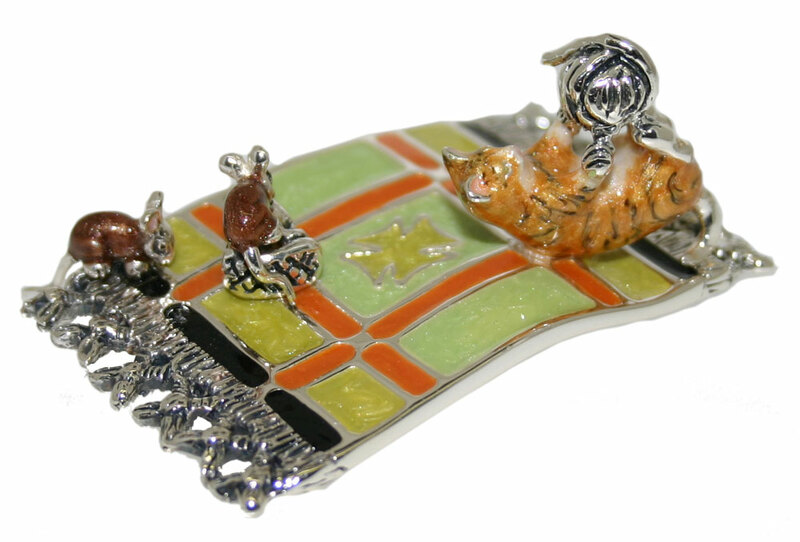 Saturno Silver and Enamel Cat, mice and Carpet Ornament - Connard & Son Ltd.
Saturno Sterling silver and enamel cat playing with ball of wool, whilst 2 mice with a block of cheese all sit on an oriental carpet, with fully enamelled pale green and orange rug, with an orange marmalade cat and brown mice. A very quirky piece indeed. This we do have in stock, in case the customer who has enquired about it has not been able to receive our emails. All items can be returned in original condition for a full refund if you are unhappy. Please advise us by telephone or email within 21 days of receiving.